Usually when we talk about giant chickens, it’s the nine billion or so big, fat broiler chickens killed every year for our consumption. And while we usually picture these animals as being too fat to walk and cooped up in their coops being exposed to unnatural light patterns, there is another breed of oversized chickens out there—and it’s even scarier to the unacquainted. A recent video uploaded to Twitter by @LifesBook_Ceo shows what looks like to be a fairly normal chicken peering out of its chicken house. But once the chicken steps down the stairs of its coop, it looks more like a two-foot tall Tony Soprano walking down the driveway to get his morning paper with a feathered housecoat on. The answer to your query, @LifesBook_Ceo, is no, you are definitely not the only person wondering why that chicken is so damn big, or why it has feathers on its toes. Many Twitter users were equally confounded by the monstrous chicken, with some saying that the video was fake or that the chicken is actually a human in disguise. The feathered beast seen prancing around appears to be equal parts poultry and, from the waist down, a fluffy velociraptor, a salient reminder of birds’ prehistoric ancestors. You would assume that such a grotesquely large creature would emerge from a lab or factory farm, but this seems like a happy backyard chicken, far from the reach of industrial agriculture. Whether this chicken is destined to become meat or how it got so big remain mysteries. The original video can be traced back to a Facebook user in Kosovo, and there seems to be a playlist of similar videos on the YouTube channel of a user named John Doe. But what we have figured out is that this is a Brahma chicken, a breed which, unlike the broiler, is naturally massive and can weigh up to 18 pounds. And according to Country Rebel, his name is “Big Boss,” which is hopefully true because that’s badass. 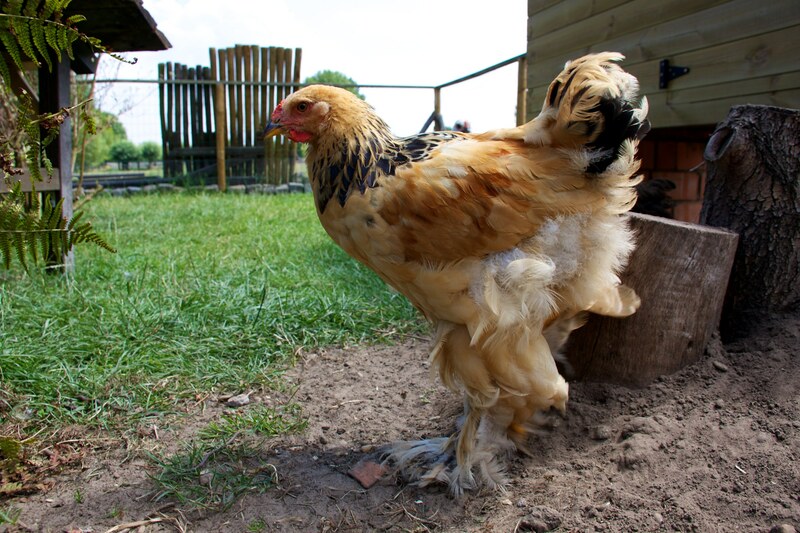 A Brahma chicken. Photo via Flickr user Thomas Vlerick. The Brahma was once the leading breed of meat chicken in England and the UK, and it was said that one could feed an entire family. However, there are still other theories floating around. But would you really want to eat the one in the video? It just might eat you first.